Everyone is sure to love this beautiful wool painting featuring a spring bouquet of lilacs. Lilacs signify renewal and freshness and embody positive energy and cheerfulness. So gazing on this gorgeous spray of flowers is sure to lift one’s spirits. 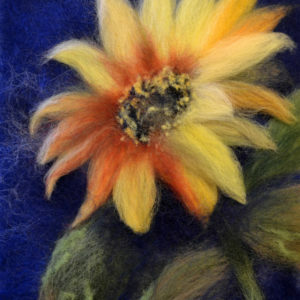 Each of my wool paintings is created with attention to detail and “Bouquet of lilacs” will prompt a closer examination of the techniques used to work with the wool fibers. The flowers appear freshly gathered and the jar has been skillfully crafted so that you can view the stems of lilacs in the water. The wool fibers forming the individual, tiny flowers on the lilac branches have been placed so that you can envision how the small blossoms occur in nature. The varied colors of the lilac flowers bouquet in a vase come together in a lovely display of white, lavender and purple shades, along with their dark green leaves. The wool painting “Bouquet of lilacs” will add warmth and charm to your home and is sure to draw the attention of your guests. 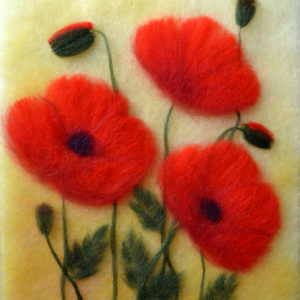 This beautiful flower artwork would make a perfect birthday present as well as a welcome or housewarming gift. 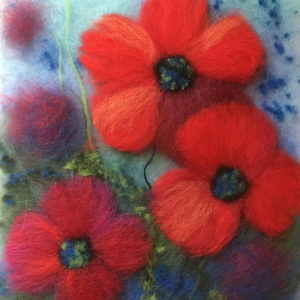 The wool painting “Bouquet of lilacs” is an original artwork. Painting size: 14 x 11 inches (35.6 x 27.9 cm). White frame – Overall size: 15 ¾ x 12 ¾ inches (40 x 32.4 cm). Black rame – Overall size: 15 ¾ x 12 ¾ inches (40 x 32.4 cm).